Come for the feast and Get the Lead Out of the Highlands on Hunter’s Mountain on Thursday,October 6, 2016. 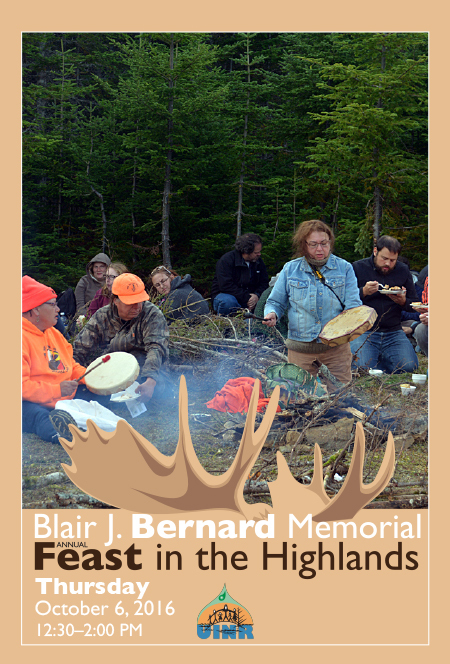 We would like to invite you to our annual Blair J. Bernard Memorial Feast in the Highlands to celebrate work on developing a management plan for moose in Unama’ki. This year will feature free bullet and fishing tackle exchanges where we exchange your dangerous lead gear for eco friendly copper. You can also try your hand at archery in a “Try It Event” organized by the Archers Association of Nova Scotia and Traditional Archers of Nova Scotia. Feast in the Highlands is scheduled for Thursday October 6 at 12:30 at the paved airstrip 13 km from the Hunter’s Mountain entrance (GPS: N 46.220834 W -60.811577). Watch for distinctive signs marking the route. For the third time, this year UINR, in partnership with the Nova Scotia Federation of Anglers and Hunters, we will be conducting an ammunition exchange to promote non-lead hunting alternatives. Harvesters can bring in boxes of lead bullets and receive copper bullets in return. Studies have shown that lead bullet fragments left in the meat and innards can cause health problems in humans, and seriously affect the health of ravens, crows, eagles, and other birds of prey. This year we are also doing a fishing tackle exchange thanks to Helene Van Doninck from the Cobequid Wildlife Rehabilitation Centre. Lead-based angling tackle, sinkers, jigs, and lures being used by many anglers will be exchanged for non-lead fishing tackle made from metals such as steel, tin, bismuth, and tungsten. For Clifford,the feast is very important–especially from a management perspective. “That we have both Mi’kmaq and non-Mi’kmaq harvesters gathered, in the peak of the season, sends a strong message of stewardship and cooperation for moose and moose habitat. The common thread for everybody present is the love and respect of the moose resource and its sustainable management. The Feast will come complete with teepees, campfires, outdoor cooking and a buffet of moose stew, eels, baked beans, fishcakes, salmon, apple pie, luskinikn, and all the trimmings.